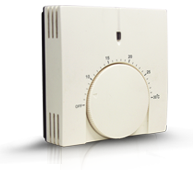 The Fantech Fan Control Thermostat has been developed to control the operation of a 230-volt fan based on the setting made on the thermostat dial. It can be set to turn on a fan when the room temperature is either higher or lower than the set point. This makes it an ideal addition for Heat Transfer Kits as it enables the fan to efficiently transfer warm air from one room to another. It can also be used to simply provide fresh air to a given space when the temperature reaches the dial setting. The Thermostat can also be used in applications such as computer server rooms, switch rooms and commercial kitchens where the accumulation of hot air needs to be extracted through the use of a ceiling, wall-mounted or in-line fans.